The melee came while most starters were on the sidelines during a special teams drill at training camp. It was unclear what provoked the fight. Several players and coach John Fox rushed to both players. Fox tried to separate the two, but it took linebacker Jon Beason to pull Smith off Lucas. Lucas walked to a tent, holding his head while accompanied by a trainer. 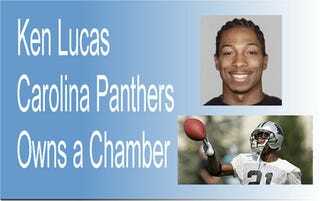 Smith was then escorted there by receiver Muhsin Muhammad to talk to Lucas. After being treated for several minutes, the Panthers' starting cornerback walked onto a cart and was taken to the locker room. There was no immediate update on the extent of his injuries. Mild hyperbaric therapy speeds recovery from sports injuries, gives the athlete faster recovery from workout, increases energy and mental clarity on and off the field. By providing more oxygen at the cellular level, healing is rapid, energy levels are high and the athlete is able to focus and perform at peak levels.